Everyone here knows the well-loved beverage Thai Milk Tea, yes? Also known as ‘cha yen’, the iced-cold drink is a refreshing thirst-quencher that is mixed with condensed milk and sugar. The popularity of Thai milk tea has gone far and wide, where we are now seeing numerous unique dessert interpretations of it. Here are 8 Thai Milk Tea Desserts in Singapore For Every Cha Yen Lover. So good that staying slim doesn’t seem that worth it after all. 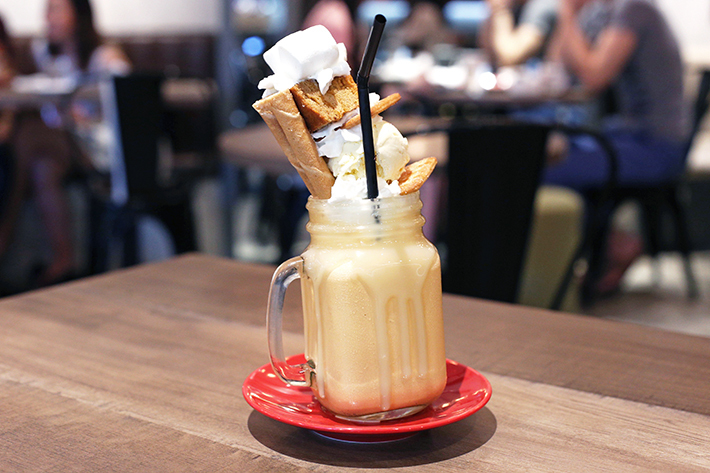 You might have seen these crazy milkshakes on your Instagram explore feed before, and Benjamin Browns’ Thai Milk Tea Shake (S$16++) is one of the unmissable whimsical beverages. The drink is topped with coconut ice-cream, Thai milk tea cake and delicious red ruby sago. One massive sugary treat here, darlings! Cha Thai’s Toast With Thai Tea Dip (S$8++) features a platter of buttered cuboid-shaped toasts that are crisp on the outside and fluffily soft inside. A saucer of Thai Milk Tea dip is placed on the side for dipping; it is a heavenly match and we couldn’t get enough of it. Yes, even the Koreans are picking up the trend of Thai milk tea. Over at Chick N Ken, their Cha-Yen Bingsu (S$12.90) is an interesting amalgamation of Thai and Korean flavours – think honeyed Cornflakes, homemade Red Rubies and Thai Tea Agar. Creamier’s Thai Milk Tea Ice Cream (S$3) is prepared with Ceylon tea brew and we totally dig its light and mellow taste – one of our favourite flavours from the popular ice cream parlour! Creme Maison Bakery is one of our all-time favourite bakeries and their desserts have never disappointed us. Its Thai Milk Tea Fudge Loaf (S$5 per slice or S$38 per whole loaf) is a delicious moist creation covered with condensed milk frosting and crunchy milk crumbles. It makes a great alternative birthday cake, especially for fans of Thai milk tea. Life is more than just chocolate lava cakes. Haha Thai’s Thai Milk Tea Lava Cake (S$10.80++) is an indulgent dessert that will have you wondering, just where have you been all my life?! The warm lava cake is paired with a generous portion of tasty coconut ice-cream. 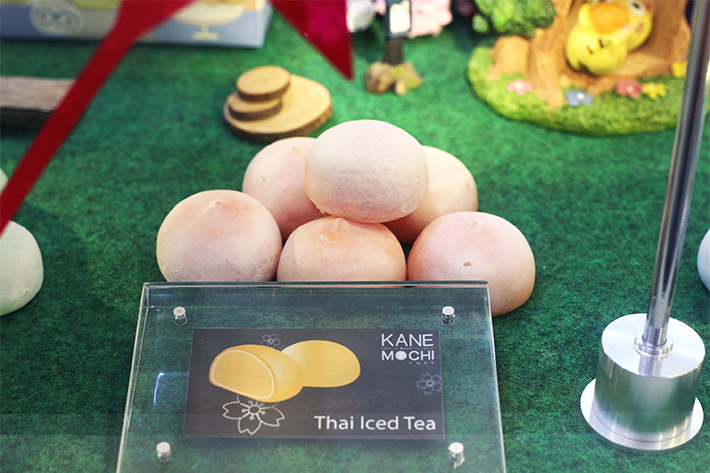 Bangkok brand Kanemochi’s best-selling icy Thai milk tea mochis (S$2.30 each, S$5.90 for three) are absolutely divine. Sink your teeth into the delicate and chewy skin which encapsulates a dollop of rich Thai milk tea ice-cream. 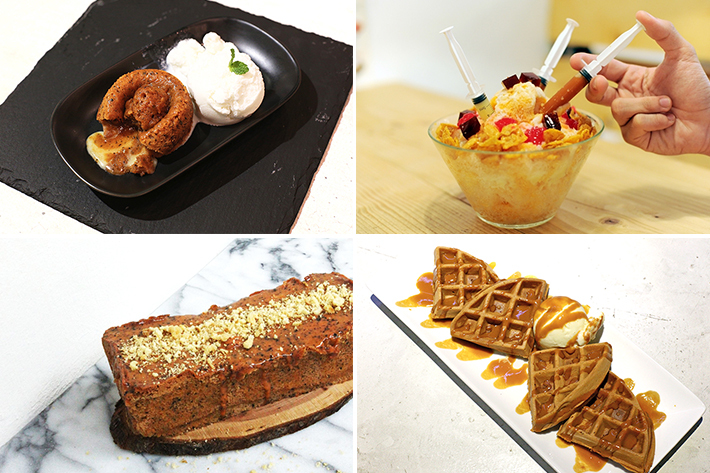 Thai In Town’s newest addition, Thai Milk Tea Waffle (S$10.90), is no ordinary dessert. 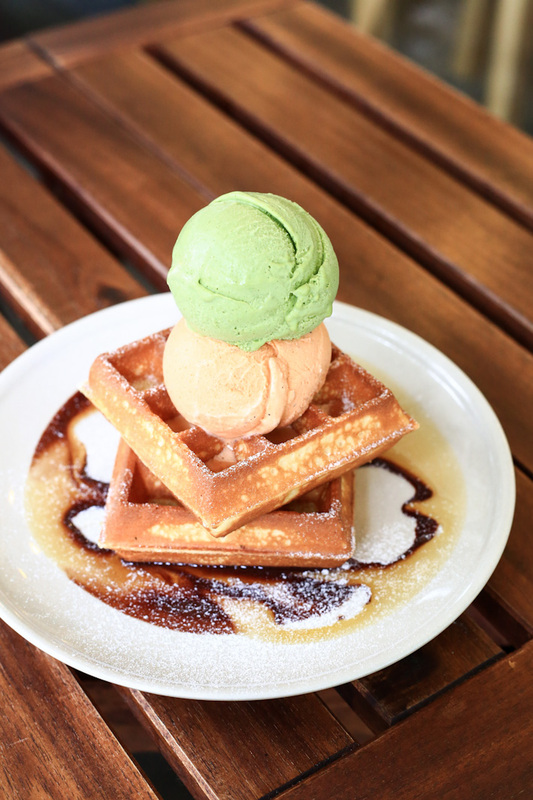 The waffles are infused with Thai milk tea, drizzled with Thai tea sauce and a scoop of vanilla ice-cream. Do note that a minimum waiting time of 10 minutes is required.